It’s been 12 long years since Juventus made it to this stage of the UEFA Champions League, and managed to beat Real Madrid to make it to the finals at Old Trafford. The build up saw Real Madrid billed as the favourites thanks to their speed, and players. Moreover, after their success against the same opposition last season, not too many believed that Real were going to be knocked out by Juventus. All that was put to rest after 90 minutes at the Juventus Stadium, where the home side put on a brave show to grab a vital advantage. Juventus: 1. Buffon; 26. Lichtsteiner; 3. Chiellini; 19. Bonucci; 33. Evra; 21. Pirlo; 8. Marchisio; 27. Storaro; 23. Vidal; 10. Tevez; 9. Morata. Real Madrid: 1. Casillas; 15. Carvajal; 3. Pepe; 2. Varane; 12. Marcelo; 4. Sergio Ramos; 8. Kroos; 10. James; 23. Isco; 7. C. Ronaldo; 11. Bale. 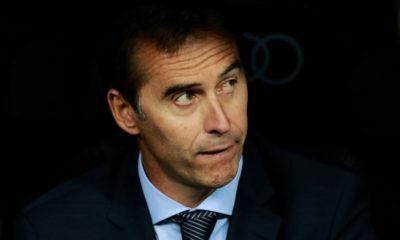 Real Madrid started the game in an unfamiliar 4-4-2 formation, without Benzema, and Luka Modric. Sergio Ramos started in midfield once again, with Isco and James starting as the wide midfielders. The wide midfielders though, didn’t play like wingers, but more like inside forwards, coming closer to the middle every time they had the chance to drift. This was to create the space for full backs to get forward, with Kroos and Sergio Ramos sitting as the holding players. The two Real wing backs are players who can get forward, and help flood the opposition area. Them providing the width means that the players cutting inside have some support out wide, and can create the space to play their killer passes. The battle began over here, as Juventus seemed focused on stopping the advance of the full backs. Both Marcelo and Carvajal love to attack, and so they were both put up against a direct opponent. The wide midfielders in the Juventus diamond seemed to be playing a little closer to the touch line than normal, and were directly involved in duels with the full backs quite often. 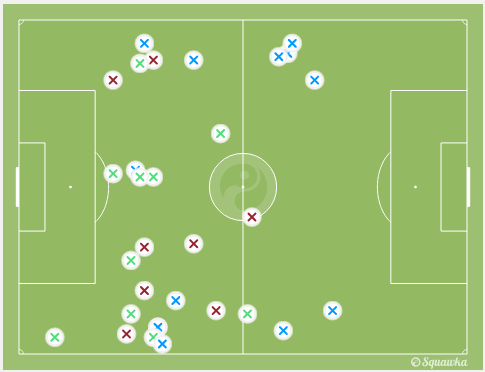 A lot of the duels were in the wide areas. This worked quite well for the Old Lady, as Real were unable to really build their attacks, and move forward as a unit. On the occasions that they did, the full backs were involved. The goal, for example, saw a key pass from Danny Carvajal who managed to get high up the pitch to make his contribution. With the Juventus wide midfielders pushing on to the full backs though, the space was there for the Real wide men to play. Sitting in front of the Juventus full backs, and with opposition only in the central area of the pitch, these creative players had the license to roam, and the space to drift. The Real goal, was scored after some good combination play led by Isco, who cut across from the left, to almost the right wing. The other avenue of attack for the Galacticos was the pace of Bale and Ronaldo, and often, Isco, who was drifting in very regularly, was playing through balls in behind from a wider angle. The pace was a genuinely scary prospect for the Juventus defenders, and the line never held. Real were able to stay onside because Juventus defenders couldn’t really push up. In the lead up to the match, we did wonder about what Allegri could do in order to make Pirlo effective in a big European game like this. Too often in the past, the magnificent midfielder has been kept out of the game by high pressing, and tight man marking. While Real didn’t really do this, both Bale and Ronaldo stayed close to him off the ball, making it hard for him to receive the ball and turn. Juventus got past this, and even managed to get Pirlo with the ball and facing the opposition goal on a few occasions. 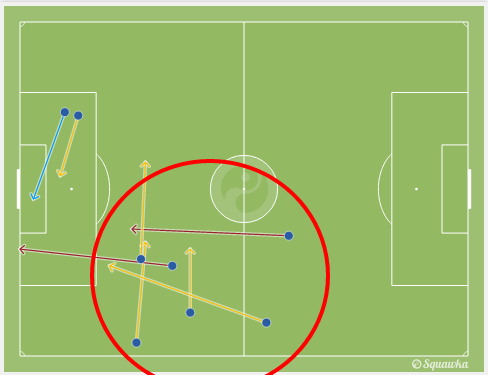 One of Vidal and Marchisio dropped deep quite regularly to help out in the initial build up phase. This meant that the diamond in midfield became a little lopsided when Juventus had the ball, but it worked, as Real were encouraged to press more, but couldn’t really do so effectively because Juventus had enough players at the back to be able to play out. 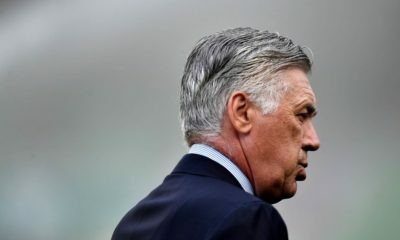 With Juventus bringing men back to aid the initial phase of build up, and fielding two strikers, it meant that there was a slight disconnect between the defence, and the Juventus forwards. Ultimately, it wasn’t as consequential, as the likes of Vidal, Pirlo, and Marchisio tried to play long vertical passes, mostly to Morata. It didn’t always succeed, with Ramos and Kroos sitting quite close to the centre backs. This solid core in the middle of the Real defence was very hard to break down, and as the game wore on, Pirlo and co. looked to aerial chipped passes over the defence a lot more. Recently, Porto showed how effective pressing the ball can be, in an excellent performance at home against Bayern Munich. 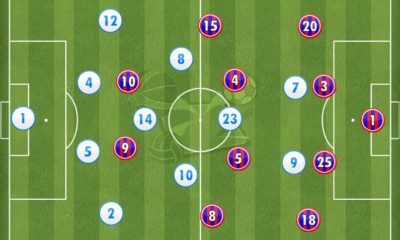 In that game, Porto varied their approach off the ball, with pressing alternated by sitting back and maintaining a compact shape. We saw a similar performance in defence from Juventus last night. At times, the side was quite calm, and sat back, allowing Real Madrid the ball, and waiting for the mistake. However, they also made sure to press Real, and were very effective when they did. The Juventus midfield got right on top of the Real Madrid midfielders, making it impossible to turn around and move play forward. They won the ball a few times doing this, with Carvajal in particular struggling under duress. On the other hand, they were quite keen to allow Real Madrid to press them. Even after Hernandez came on, and Real were making more men stay high up the pitch, Juventus started the play with short passes. This only served to open up a gap between the Real front men, and those that stayed deeper. This meant that the likes of Morata had more space to play in, especially when it was played to their feet. Tevez was also getting a lot more space to run into, and he did a terrific job picking up the second ball. There was a lot of trouble for the defenders when the Argentine got on the ball. What would we do, if given the William Hill Promo Code? Speaking from a Real perspective, one feels that it was a mistake to tweak the formation, and start the game without a recognised striker like Chicharito. The change in shape allowed Juventus to push their left and right midfielders a little wider. It was also a slightly unfamiliar shape for them to use, and Gareth Bale looked very lost in his role as a striker. Of course, injuries affecting a thin squad didn’t help. The normal 4-2-3-1 that Real apply would possibly have been more appropriate in this match. Frankly, the tie is on a knife edge. Juventus have a slender advantage going into the second leg, but away from home, at the Bernabeu, anything can happen. Real did worry Juventus, but not enough in the first leg. The likes of Ronaldo and Bale have the ability to turn a match around very quickly, and you wouldn’t bet against them scoring at least once. The onus, therefore, is on Juventus to find the back of the net. Neither team can really let their guard slip, and both have pretty much the same objectives. Expect to see a tense encounter, with both sides going for it, especially if we are goalless after 45 minutes. Massive Chelsea supporter. Follow Mourinho and love Ronaldinho. Enjoy discussing tactics anytime, anywhere. Enjoy watching the Italian National team as well.